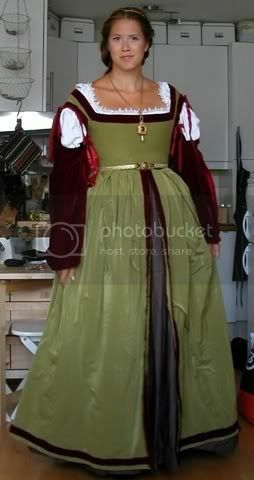 AWARDS: This dress won the Gold Rose in the Rose Award 2008 (pre-1550 category). I am SOOO grateful for this, thanks a thousand times! This dress was a project I originally decided not to do, but it never left my mind. And getting such a positive feedback when I finally got around to make it... It means more to me than I can say. Raphaels portrait "Lady with Unicorn" shows a young woman in 3/4 profile, sitting in front of a loggia with columns, revealing a landscape in the background. It was originally oil and tempera on wood, but was later transferred to a canvas. It measures app. 65 x 51 centimetres. 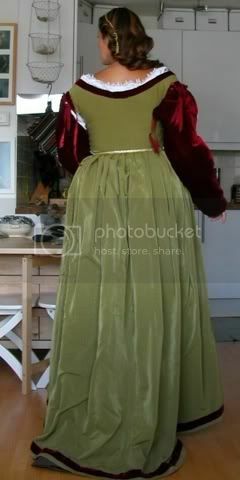 The sitter's dress is clear moss green with winered velvet trims, and with matching winered sleeves tied to the bodice. The red is repeated in her ornamented gold pendant, with a red stone and a white drop shaped pearl. She wears a white camicia visible at the shoulders and in the neckline, and she has a small unicorn in her lap, which gives the portrait it's name. This unicorn was overpainted sometime in the mid 17th century, to make the portrait a personification of St. Catherine of Alexandria. Other changes were the addition of a lined cloak hiding her bare shoulders and the sleeves of the dress, and a palm leaf and a wheel alluding to her martyrdom. The hands were also re-modelled. 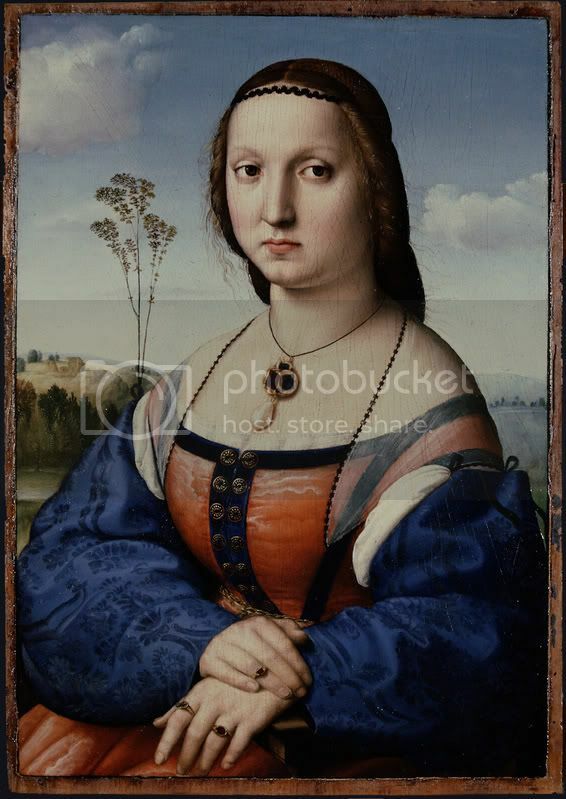 It was listed in the Borghese inventory lists in 1760 as a work by Perugino, but after it's restoration in the 1930's the martyrical iconography was removed to reveal the unicorn and the original details, and most now attribute it to Raphael. 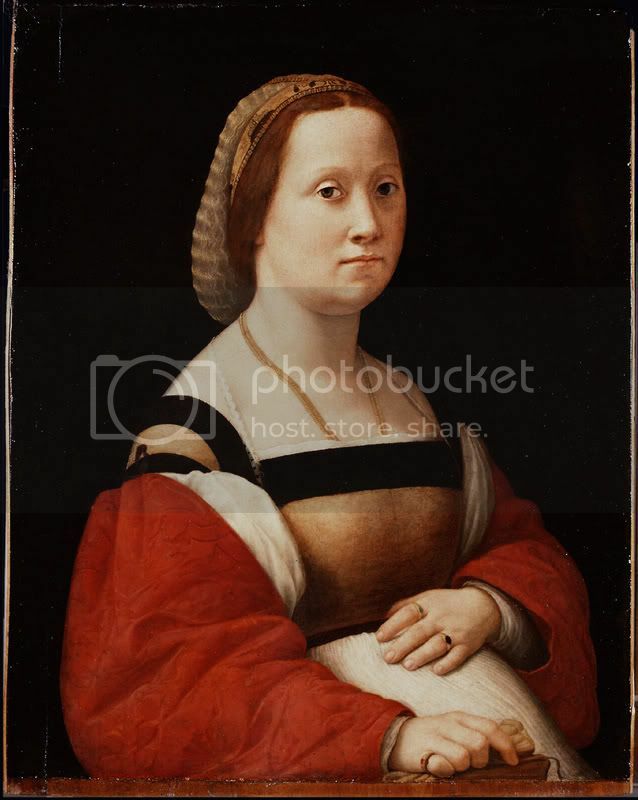 Art historians place this portrait to 1505/1506, contemporary with the portrait of Maddalena Doni, also by Raphael. X-rays has shown that the unicorn might originally have been intended as a small lapdog. 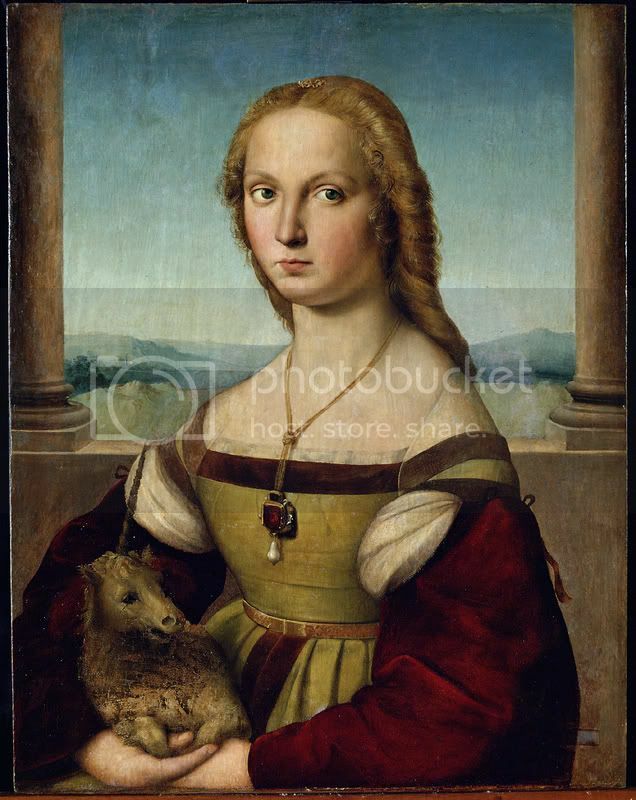 One theory is that this was first intended as a betrothal portrait showing the young bride with a dog (sign of fidelity), and when the wedding didn't happen Raphael or his workshop transformed the dog into a unicorn. This might explain the further transformation into St. Catherine a century later. But this is merely a hypothesis, it offers one plausible scenario to the many changes of this painting without offering any proofs. What the jewellery and rich, colourful dress DO tell, however, is that she was a fashionable and well-to-do young lady. 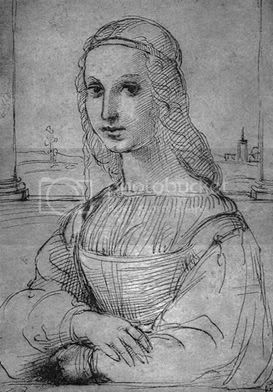 It is reported that Raphael saw either an unfinished painting or a preparatory sketch of the Mona Lisa in Florence in the early 1500's, and that's what he based his "Young woman in a loggia" sketch on. The standard portrait pose in the early Renaissance had been the profile view, inspired by antique Roman coin/medal portraits. That was reckoned as the most noticeable feature of a person, and hence best suited for a picture displaying likeness of the sitter. One reason for the Mona Lisa's fame was that the sitter was partly turned towards the viewer, displaying the face and the body in a new and more direct manner (Field 2006, page 352). This had been done before. 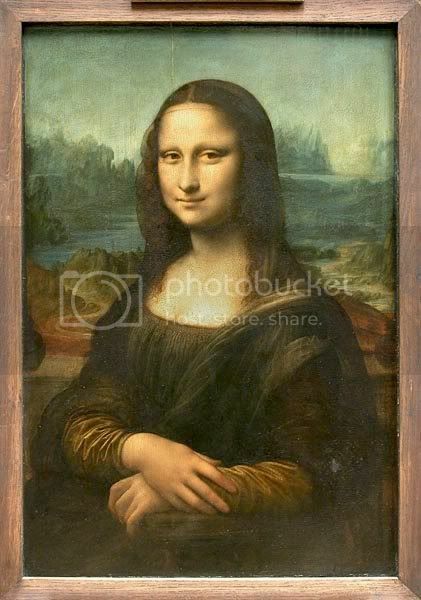 But Mona Lisa turns towards the viewer AND she's smiling, revealing her personality in a different way than the female profile portraits of the time (Tinagli 1997, page 77). As an anecdote, it should be noted that "Gioconda" (last name of the proposed sitter, and also the French name of the portrait) is related to the word "joconde", which means playful, flirty, joke maker. This might be why Leonardo depicted her with a smile. He was know for making puns of the sitter's name. The lady with unicorn doesn't have the playfulness of the Mona Lisa. But it follows the concept closely, with a young woman depicted in 3/4 profile in a loggia or balcony with a landscape in the distance. The woman is seated in an unseen furniture of some sort, and she's got the small unicorn in her arms. 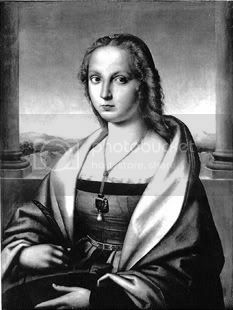 Her dress is of similar style of the Mona Lisa one, but the bodice is tighter and with wider shoulders, and she sleeves are also wider. 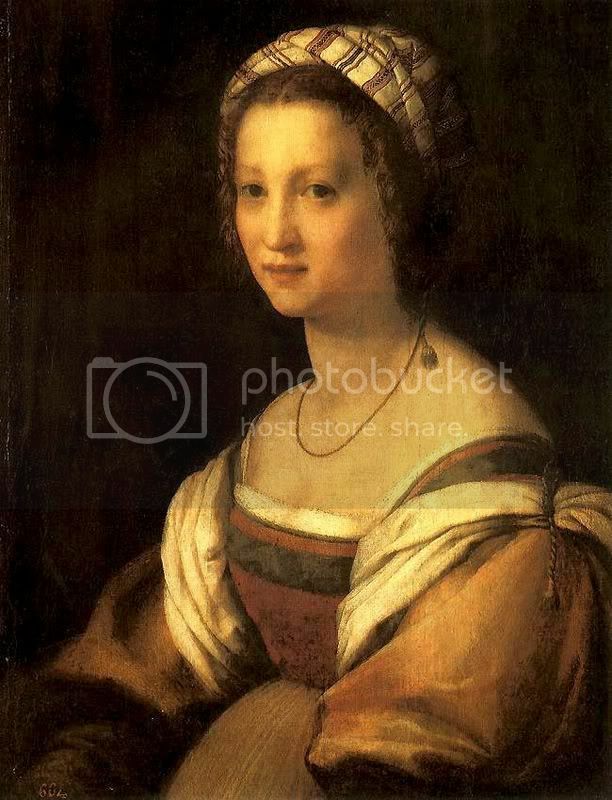 The dress used in Florence in the early 1500's appears more modest in style than what we see in Venice and Milan. Some attribute this to the pious monk Girolamo Savonarola. Until he was executed in 1498 he more or less ruled Florence. He got the Medicis expelled, and organised "bonfire of the vanities" to destroy items of vanity, like jewellery, fine fabrics, paintings, statues, books. This affected the fashion of the time, partly because people hid away their valuable items to avoid their destruction, and partly because it would be unnecessairy provocative to "flash" wealth in the 1490's. The modesty in cut and details stayed in fashion for at least 15 years after Savonarola's death. But from then on Florence experienced a growth in the silk industry on account of the wool industry, and it soon became a patriotic ting to display the fine silk fabrics the city produced. This was under the new reign of the Medicis from the 1520s on, and the court life flourished as never before. The beginning of a new elegance is viewable in the portrait of Maddalena Doni, whose husband was a cloth merchant (Tinagli 1997, page 98). She wears a dress of a red-orange watered silk combined with rich blue damask sleeves and silk velvet ribbons. 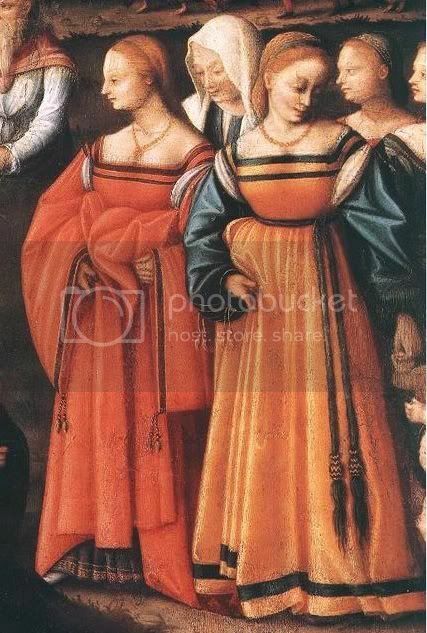 Such decorative guards on bodice and skirt hem, combined with sleeves that differs from the fabric of the dress, is the decorative elements that are most likely to occur in Florentine dresses of the early 1500's. As for the Unicorn dress, it looks like a fine green silk has been used for the bodice and skirt, while winered velvet is used for the sleeves and the trims. I suspect the same kind of velvet was used for sleeves and trims, so I made the trims for my own dress out of scraps from the sleeves. It gives a nice authentic touch. The bodice has velvet guards on the neckline of the bodice as well as the shoulders, and also two stripes going down in front of the skirt. This might mean that the skirt had a front opening, but it's hard to tell from the portrait alone. If it IS a front opening, it's a most unusual feature in an otherwise traditional dress - just like the Maddalena Doni one is a bit different with the front lacing of the bodice. The bodice reveal a slight wrinkled appearance in an otherwise smooth front. It could be a later damage, but it looks painted and intentional. 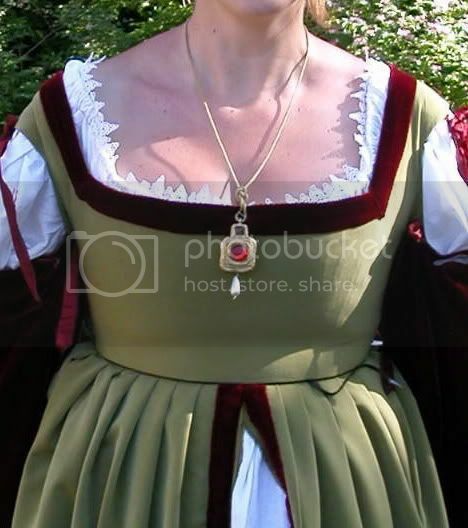 The winered sleeves looks medium wide, and they're fastened to the bodice with two decorative ribbons on each shoulder. This enables the full, white camicia to be viewable under the arm, and we also catch a glimpse of it in the neck opening. 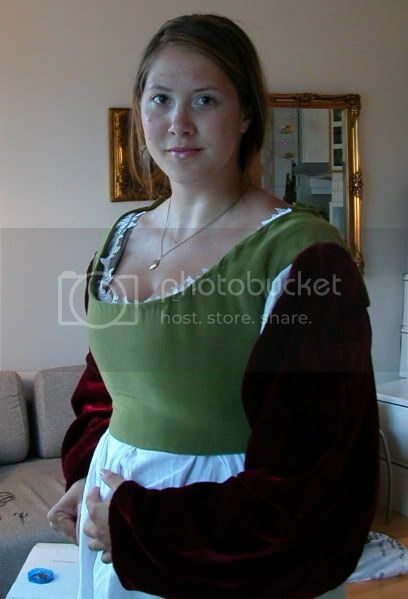 I've later wondered if the sleeves are tied to the bodice UNDER the arm as well as over. From the way the sleeves behave, I'm inclined to think they are. I'll do a little experiment in my own dress. 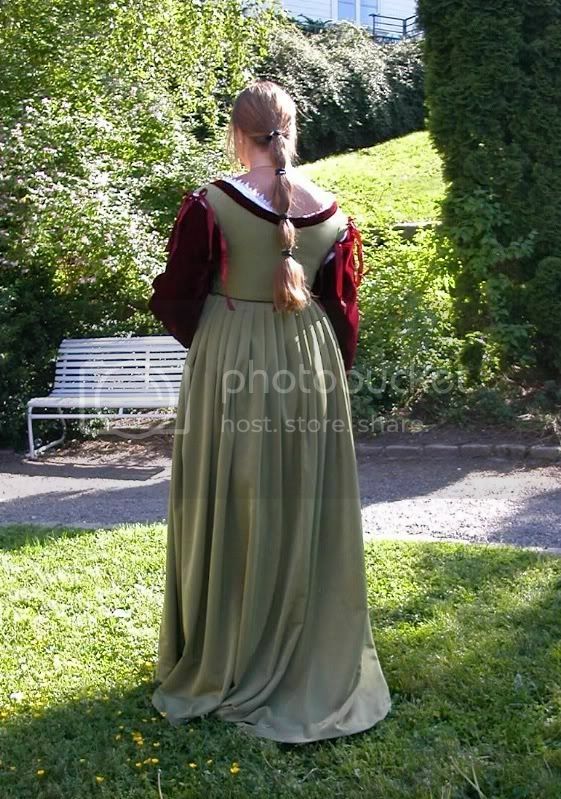 She also wears a hardly-visible partlet over her shoulders, it appears to be made of the finest possible silk. This is something I have yet to make. She wears various kind of jewellery. A golden, ornamental "hairband" can be seen in her hair, but it's the pendant that steals our focus. 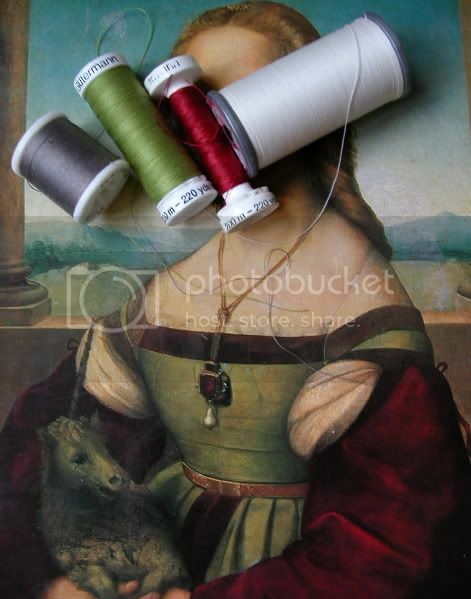 The red, greenish and white colours echoes the dress, and the knot on the chain serves as the centre of the painting. The pearl was usually worn by engaged and newly wed women in the early Renaissance, underlining her age and position. That iconography is further emphasized by the unicorn, which (according to the myth) could only be trapped by virgins, and when trapped it would sleep in her lap. It might be a sign of it being a betrothal portrait, underlining the bride-to-be's virtues, or it might be as described above, a lap dog later being transformed into a unicorn. She also wears a belt with a clasp in front. I suspect the belt is made of a sort of metallic weave fabric, not too unlike the earlier so-called "Eric of Pomerania's belt" (which is nowaday assumed to have belonged to a woman). For constructing this dress I used various inspirational sources. I started with studying all the portraits from the era which I came across. I then tried to find period patterns, but I soon enough found out there weren't any. The only surviving Italian dress from the early 16th century is one from 1524, from the grave of Isabella of Aragon. Alas very little is published on this dress, and no patterns is available, so it could not be used as a basis. Closest I got was Eleonora di Toledo's funeral dress from 1562. Whereas the bodices became longer and stiffer later in the 16th century, the neck opening and side lacing remained pretty much the same. 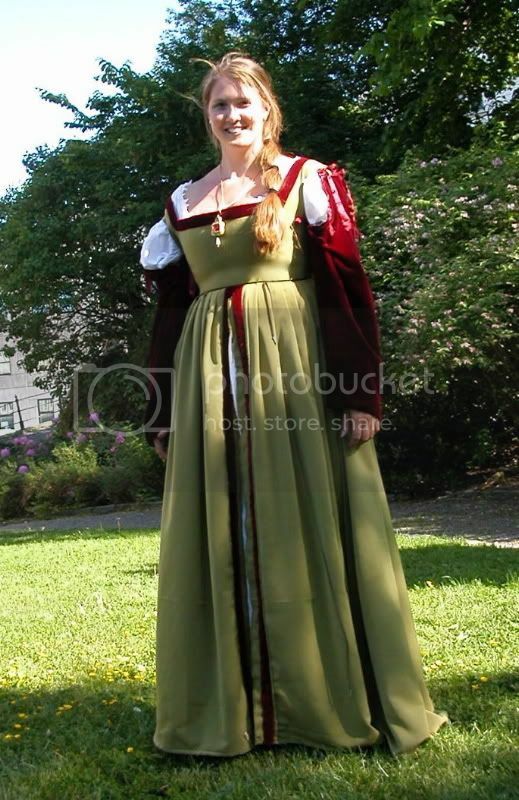 Jennifer Thompson modified this pattern when making her own Florentine dress, and I used her diagram as a basis. The trick is to get the shoulders wide enough out, hugging the outer cap instead of hanging over the shoulder like a waistcoat. 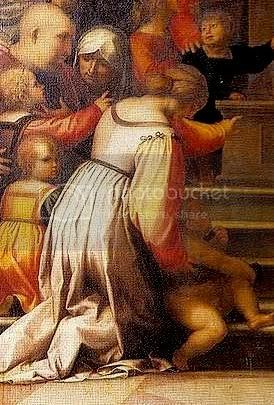 I found that the curved and fairly high back, as is seen in an inspirational portrait, helped keeping the shoulder straps in place. 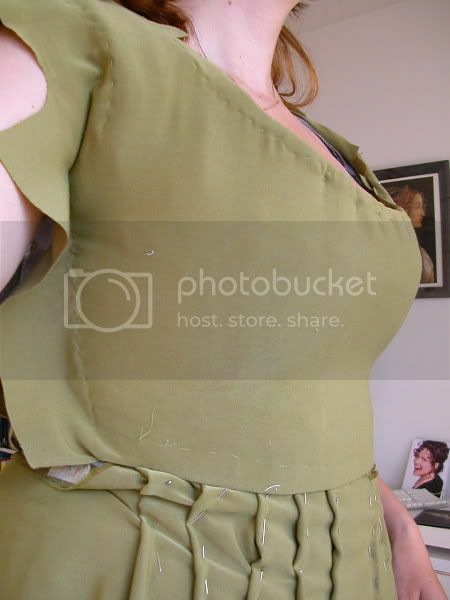 The bodice was stiffened with hemp cording (another details nicked from Jennifer Thompson) and interlined with raw silk. This gave me a smooth, yet curvy bodice. The skirt got its main shape from the 1639 Dorothea gown in "Patterns of Fashion". Again out of period for the portrait, but I chose this because it seemed to have the right shape, and it also had a front split. 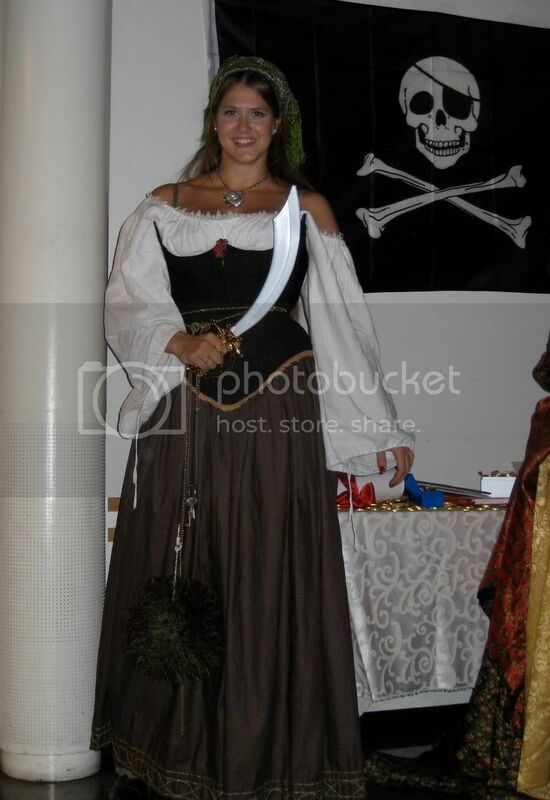 I used as straight panels as possible for the construction, and the skirt was knife pleated to the bodice. Alas I didn't get to line it, as I didn't have any fabric at hand and was in a rush. Strips of the silk velvet used in the sleeves were attached down the front and also around the hem. The skirt has a small train, and it's nicely emphasized by the contrasting trim. To mimick a woven metal belt, I dressed a strip of rigilene with a golden fabric with an ornamental pattern. A metal clasp was added in front, a bit different than the portrait, but the closest I came at the time. The pendant was made of clay on a metal wire fundament, and painted golden. I also attached gems and a pearl. I always wear this dress with an ornamental underskirt. My preferred one is a purplish brown cotton satin skirt. The hem has golden embroidery, and is stiffened with strips of wool (the "doppia" technique explained in "Patterns of Fashion" and "Moda a Firenze", on Eleonora di Toledo's skirts). Under it all I wear red knee stockings with red garters, and a white linen chemise with wide sleeves. This dress is unbelievably comfortable to wear, because the bodice is side/back laced and sits rather high. It's like a good bra with a skirt. The arms can be untied so the dress is sleeveless, and the underskirt can be varied. It's my preferred dress, if the occasion permits it. I've worn it to fairs and balls, and I'm impressed by how well the silk behaves. The only thing I regret was not lining the skirt, but it's too late at this point (meaning, a lot of work). I finished my last Art history exam today, and I am so desperate for a new sewing project.... I have this gorgeous green silk plus hemp thread already, so I only need wine red velvet plus lining. I ran to my favourite fabric shops in the eastern part of Oslo earlier today and found a *gorgeous* silk velvet on sale - yay! I also picked up a grey (fine) slubby silk for lining. Then I ran home and started cutting the bodice. Status quo now: the toile is good and I can start sewing canals for the hemp thread. As usual, Jennifer Thompson should be credited. I still remeber how my jaw dropped first time I saw her early Florentine dress, and her hemp boning technique is wonderful. It's the most flexible solution I've come across as of yet, and I recommend it to everyone! See references for link to her site. I was at work today, so I got little done before the afternoon. When I came home I kept sewing the canals like a maniac - this time on machine! I usually do it by hand, but since hemp threads are only half as wide as rigilene and the likes it would be twice as much work... Thanks to a nice sewing night with fellow costume makers I got to "hemp" much of the bodice today, and also fit it over the shoulders. For some reason they thought the hemp smelled like hay... which it does! We joked about being stopped by the police at the way home. A police dog sniffing my costume... Would be interesting. He-he-he. I've been pondering about the winered velvet strips on the skirt. What are they? It seems like they lay on top of the green velvet, because they're higher up and don't match the pleats. They are split, but does that mean they indicate a split skirt? 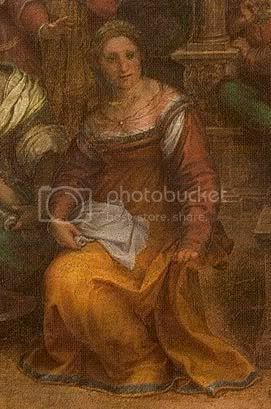 Or are they merely trims as we see a lot of in post-Raphael dresses? Are they a part of the belt? Did the seamstress run out of fabric? I haven't found anythinf similar in other paintings of the era (I've looked through app. 150 period paintings from the era... Many of which can be seen here). It's a mystery... But I don't wanna choose a solution I find out is wrong, as I'm trying to stick as close to the portrait as I possibly can. I've spent today living in a small costume bubble. All I've done is worked on the bodice, and there's really progress here now. The green silk has been cut, so I've pinned it all together to see how it looks. It looks good! All hemp is now in place, and the ends have been fastened by farious seams. I've also inserted metal eyelets in the sides. They will be covered with fabric, and there'll be handsewn eyelets covering them again. That should make them both steady and nice-looking. Because of the progress I've now revealed the new project in my Livejournal. Sunday and sewing day. I spend the day with my cousins, and we were all doing different things while chatting. I was sewing, one studied for her exam, another was cleaning. Cozy! A lot of progress, but mostly non-noticeable. I added an interlayer between the "hemping" and the silk to get a smoother surface. All layers have been stitched together (time consuming, I tell 'ya! At least when aiming for a perfect, smooth surface). Started on the handsewn eyelets as well. Must go to work in a few hours, but I have sewn four eyelets so far, and hopefully I'll have four more down before I have to go to work. I cut a tad of the lenght of the bodice, to get it more like the portrait. I need to ger it more ringed in the neckline, but otherwise the shape is getting good! I had a buzy day, so all I got to do was to sew three more eyelets. I'm thinking I should have 7 on each side, not 8. The one on top will make the arm hole very narrow. I've made one of them already, but I think it can be covered up rather well. Pictures!! 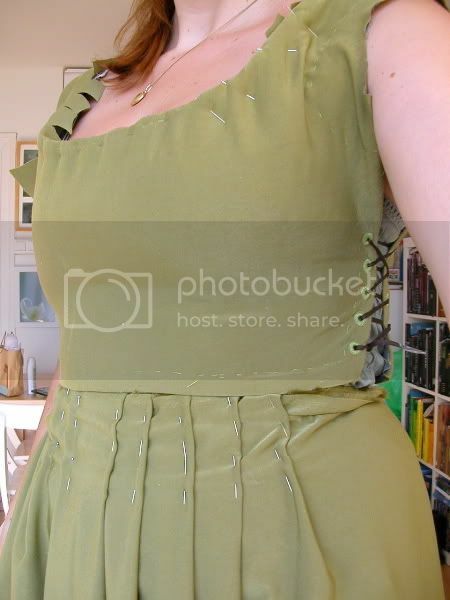 As you can see, the left side of the bodice has proper eyelets. I pinned the remaining fabric on just for the photos, this is not the final version of the skirt! 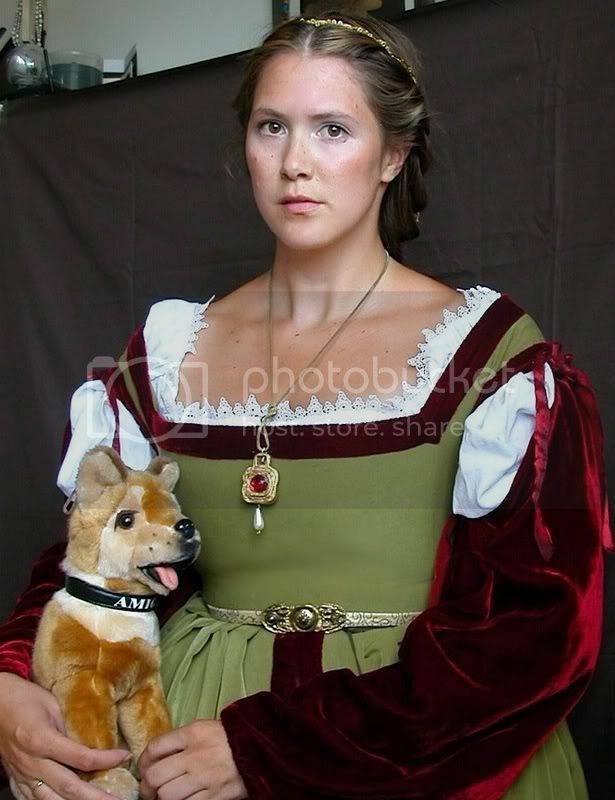 I'm thinking I cannot have the bodice as ringed as in the portrait. I get so chesty... The portrait dress shows a more flat style. But I need to angle the shoulder straps a tad more. The silk is sooooo gorgeous, so... me. I love it. Sleeves are cut and sewn! The outer fabric is made of winered silk velvet (I'm suspecting the bottom is viscose, though), while the lining is identical to the bodice lining (grey, fine slubby silk). Once I got the shape I wanted (more or less), the rest was quick and easy. The left side of the bodice lacing is finished, while the right remains. Hopefully I'll work on that tomorrow. The bodice has also been shortened a tad, and the shape is sooo good as it is now! Thanks to my fellow Livejournalers for that advice. Been working a LOT on the bodice today. All lacing holes has been sewn, minus three. Although they could be prettier, they work just fine and it's nice to try out side lacing. Most raw seams in the bottom has been fixed, but the shoulder area needs some work. I need to cut a bit more in the neck opening + re-pin the shoulders to get a broader and squarer look. 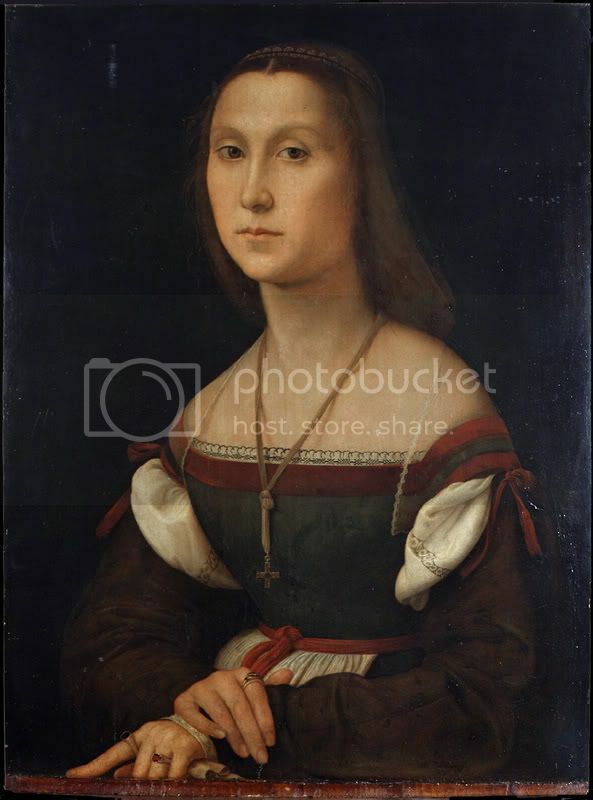 A fellow art historian was presented for the project today, and we discussed how the guard/trim around the neck opening overlaps on the right side (right over the white "fluff"), but not on the left side. He meant it was due to her posture (the left arm is further out, to support the animal). I agree. But it must also mean the trim cannot be sewn all the way out? How else can they overlap like that? While discussing that I noticed that the round sleeves seems to be fastened underneath as well as on top - look at the area under her left arm. I think that helps maintain the "fluffing" of the white chemise sleeves (I didn't "fluff" in the photo overneath). After having struggled with an exam from June 2. to 5. I was ready to continue with my Unicorn dress. The bodice is complete, minus the trims on the shoulders. The skirt is sewn and attached, and has two (hastily attached) guards in front, but I didn't have time to make one for the skirt hem before wearing it at Kj�mpestaden. The sleeves needs to be narrowed, but are otherwise complete. Remaining stuff is to add guards at skirt hem, shoulders and skirt front (or at least improve them), and to make a belt and a decorated petticoat. My grandmother agreed to do the embroidery, hooray! The jewellery is also quite cool. 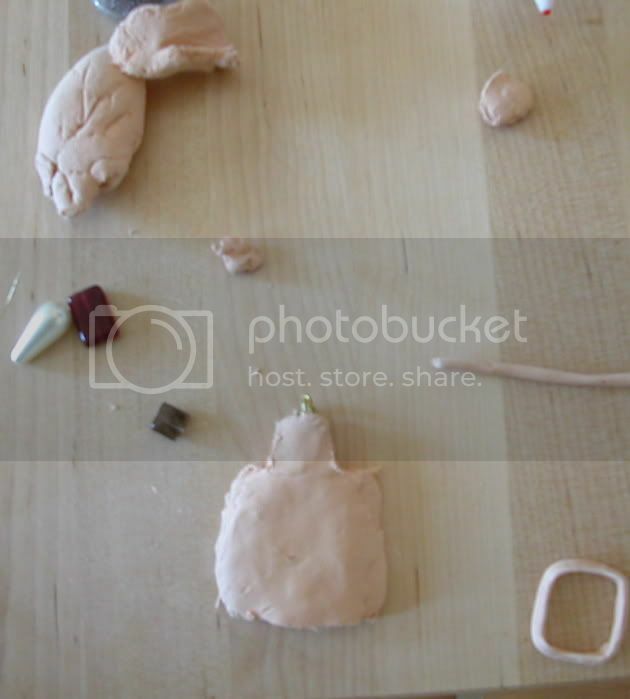 I made an appendix with a metal thread base, and "dressed" it in lightweight porcelain doll clay which needen't be baked. "Gems" were inserted, and the whole thing was painted golden. I found a suitable chain at H&M, though it was a bit short. The appendix is such a vital part of the portrait, so I wanted a version of it when I wore the dress for the first time. Premiere for the dress! I wore the Venetian chemise underneath, and it suited the clean style of the Florentine dress. The green silk is so vibrant, it changes nuance and shine according to the light, and looks really yummy. The silk velvet isn't shabby either... The fit of the bodice is good, but sleeves needs to be narrowed a bit, and I need to find a better way to "fluff" the chemise at the shoulders. 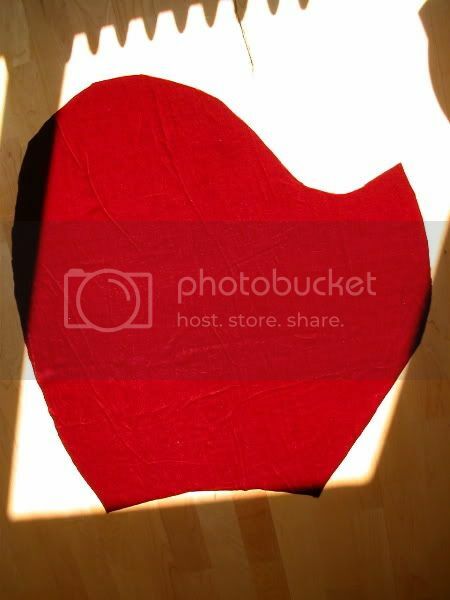 I aspecially like the shape of the skirt, and the split in front was really comfy... I think I must keep it. OK, so remaining areas are: guards on skirt hem and shoulders, an embroideried petticoat, plus a belt and a golden hair brace thingy. Returned from Greece yesterday, arriving just in time to take some new photos for Bella/Realm of Venus. Since last update I've made a brown petticoat (which will later have a gold embroidered hem), and I've also added all trims on bodice and skirt, plus finished the belt. One unfortunate problem is that the brown cotton petticoat sticks to the peau-de-peche silk like glue, making an irritating "balloon effect" in the dress skirt. This makes the skirt appear shorter than it is, and it also makes the fine pleats in the waist wrinkle. I'll have to deal with it later on, but... grrr... Though I never made a partlet for this dress, I reckon the project overall to be finished. I've worn the dress on two different occations, and it was a most comfortable outfit. 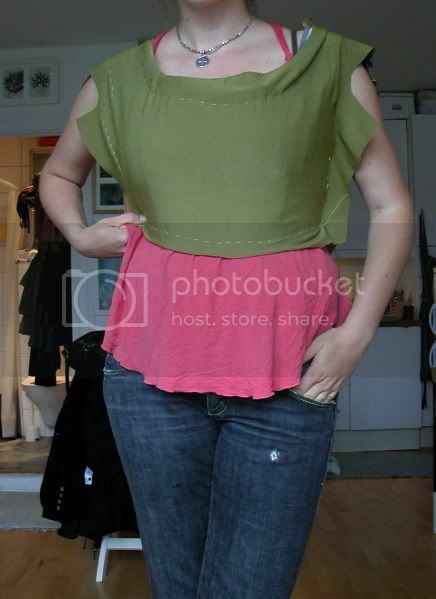 It's also something I CAN put on myself (though it distorts the look of chemise a bit), since it's side laced. Though the dress in the portrait has even cleaner lines than mine replica, I'm very satisfied with my dress, and I still adore this period. My beloved grandmother has embroidered the hem of the brown underskirt. It looks so nice! I haven't been able to take new photos of the completed ensemble yet, but I've worn the petticoat as a part of another outfit: a Renaissance-ish female pirate! The costume consisted of the embroidered Unicorn underskirt, a quasi-historical corset, my Venetian lace chemise and the Maddalena Doni girdle. AaarrrRRrrRrRRrrrrrRrr!